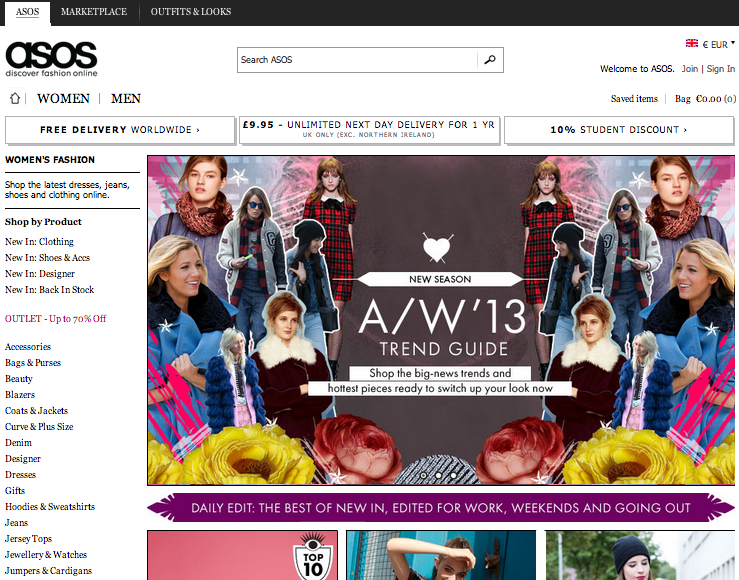 ASOS.com is one of the UK’s largest online fashion and beauty stores for both men and women. You can find awesome stylish clothes at great prices, especially during the sales. ASOS’s sells branded clothes and accessories as well as its own range, so you can find a wide array of different designs and prices to suit your style and your wallet. Great discounts and promotions from 20 % to up to 80 % off! For just £9.95 a year you can get unlimited next day delivery without minimum order value as well as early and exclusive access to offers and sales, and 10 ASOS magazines a year! Measure yourself before buying to know your exact size, everyone wants a perfect fit! ASOS is one of the best online marketplaces for budget, fashionable clothing. With tonnes of designer brands as well as ASOS’s own brand for cheaper yet stylish alternatives, men’s and women’s clothes and accessories have never been so accessible. Go back to our Clothes and Accessories category for more sites offering great discounts, deals and offers on clothes and accessories.